The manifestation of an action, object or thought (if it can be defined) necessitates a point of origin or departure, in relation both to the manifestation itself and to the person who is conscious of its emergence. The point of emergence does not necessarily reveal its causation either in the field of its emergence or in the mind of the viewer. In the mind the point represents a unitary focus of conscious awareness; in the physical world it represents a focal event in a field which was previously uninterrupted. In their second exhibition at Galerie Daniel Buchholz, the Dutch artists Jeroen de Rijke and Willem de Rooij show an installation of recent photographs. Entitled “The Point of Departure” this show marks the beginning of a cycle of works which tackles the ornamentation of oriental carpets. de Rijke / de Rooij have already in previous works dealt with the iconoclastic characteristics of Islamic culture (i.e. the 35mm film “Of Three Men”). The non-figurative and decentralised aspect of Islamic iconography achieves a high degree of abstraction, which de Rijike / de Rooij compare with the minimalism of their own room and film installations. However, the “plainness” of these installations is rather understood as a focus of concentration than a reduction in the true sense of the word. the title “The Point of Departure” is not least to be seen as guidance to seeing or, as mentioned in the quotation above, as definition of the demands on the own work and its perception. Applied to Islamic iconography, the latter can be understood as a “positive” iconoclasm, like Adam Lowe depicts it in his article “To See the World in a Square of Black”. 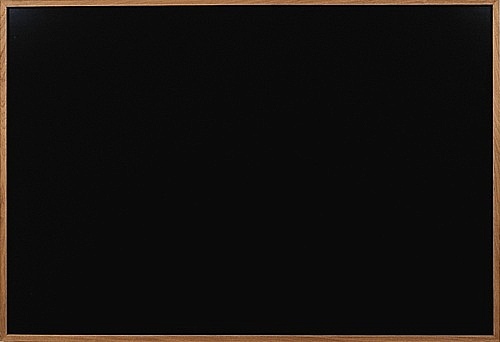 The picture being described as an abstract representation of the universe. Starting point of the artists’ new works (i.e. photos as well as a 35 mm film coming soon), was a comprehensive research work on oriental carpets, their patterns and regional origins. Cultural-historical researches revealed in particular that the significance of the different ornaments is hardly known until today. This fact is in sharp opposition to the huge time span in which these carpets have been part of our Western culture. A large number of carpet experts stick to the opinion that the entire ornamentation of oriental carpet consists solely of floral motives and reject any other associative determination of shape. What most fascinates de Rijke / de Rooij is particularly the fact that the carpet patterns are uninterpretable, but also the specific features with which they can be assigned to a place of origin. The carpets thus obtain the character of a secret language which in the various regions has been passed on in the form of a craft tradition. De Rijke / de Rooij show two large-format photographs. 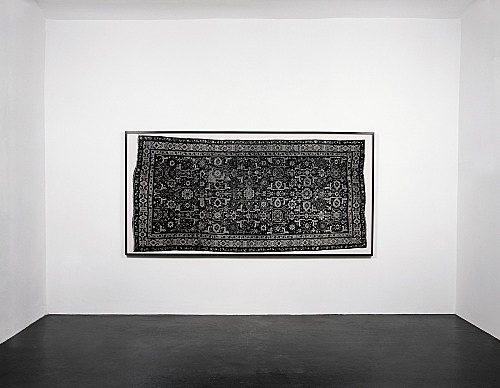 One is a black and white full-size reproduction of a so-called shirwan rug made in 1800. The carpet originates from Baku, the capital of Azerbaijan located in the Shirwan area. It belongs to the collection of the Rijksmuseum in Amsterdam. A remarkable feature of this carpet is its pattern – called afshan pattern – which covers quite evenly the entire surface. 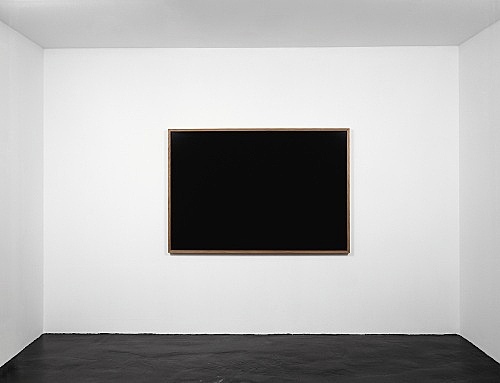 In contrast to it, the artists show a monochrome black photograph which represents both, the presence and absence of all possible pictures.  This black image is a filmstill from their upcoming 35mm-film which will be premiered during the course of the exhibition, on Friday, 29 November, at the Cinema of the Museum Ludwig, Cologne (8 pm). At the artfair stand of Galerie Daniel Buchholz at this year’s Art Cologne, de Rijke / de Rooij present a work that refers to the installation at the gallery and the film. “Bouquet I” 2002 is a flower bouquet that the artists commissioned at a florist, to be made inspired by an image of the photograph of the oriental rug exhibited at the gallery.